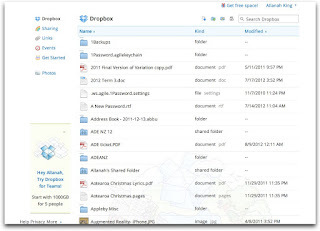 Using Dropbox is a great way to store your stuff on line but you can also use it to link to other media like pdfs, video, audio and content that you have made but that Blogger won't handle. It does all the tricky stuff for you. 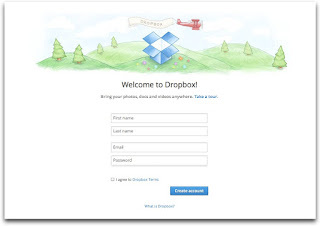 The first thing you need to do is got to Dropbox and make an account. 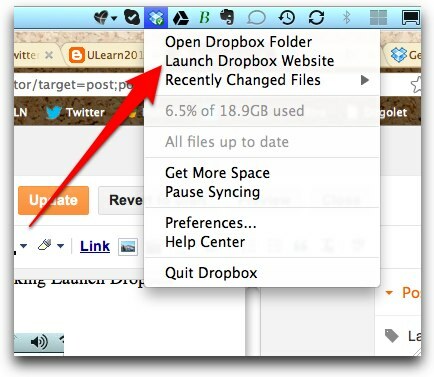 Then download the Dropbox application. Launch the application and it will put a little icon on your taskbar. (On an Apple the icon is in the top menu bar, on the bottom in Windows). There is an iPad app as well. When you click on it it will get an option to open a folder. Now you can put stuff in it. 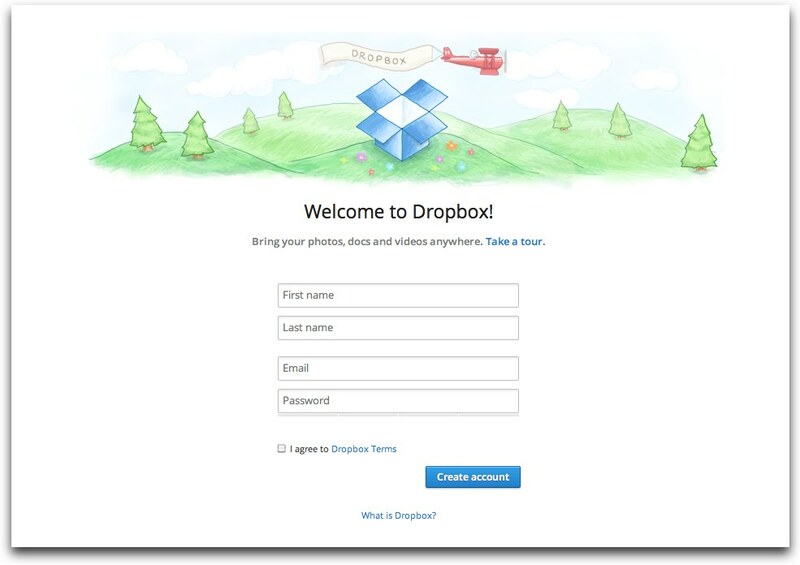 You can now go to any computer, log in to Dropbox via the web and have access to your content. 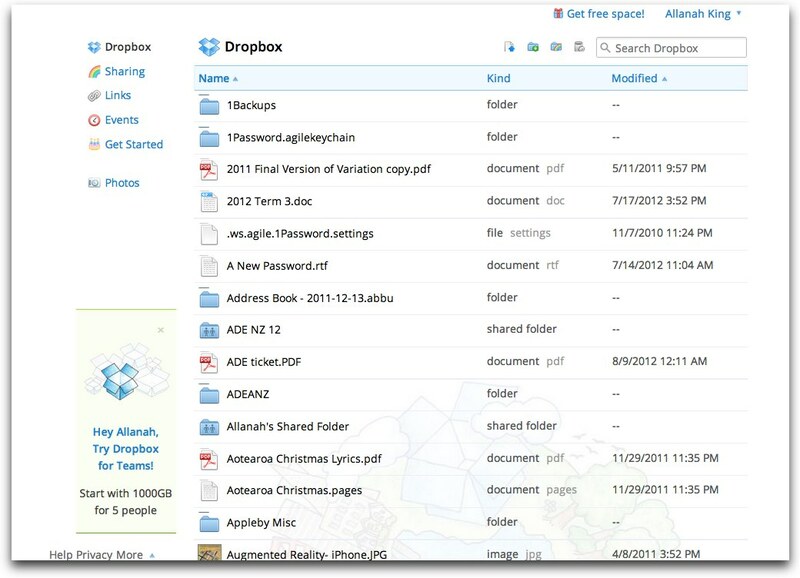 If you haven't got Dropbox installed (say you are at a friend's place and want to show them something) you can still go to the Dropbox website- log in- and download your stuff. 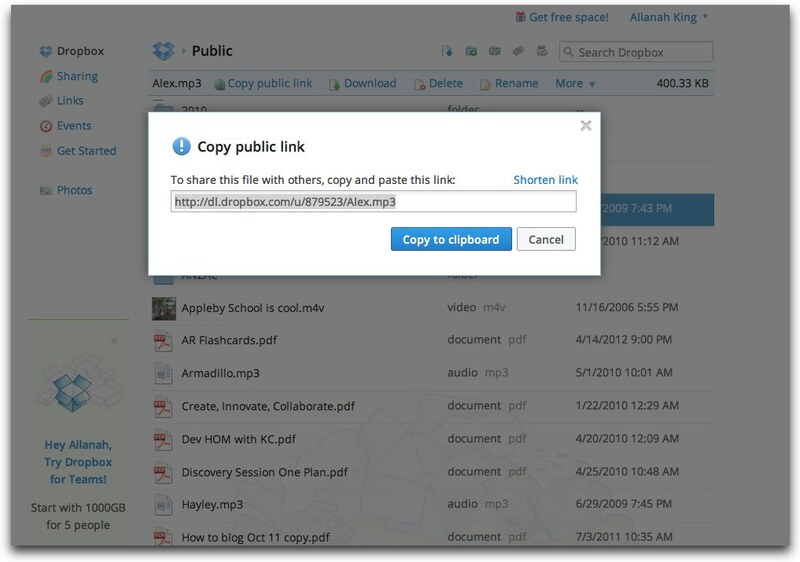 My Dropbox has got stuff in it now but it comes standard with a Public Folder- put the content you want to link to in that. I have made my Dropbox folder all pretty cos I'm an Apple user but yours will look something like this but without all the pretty colours and the stuff that I've already uploaded. 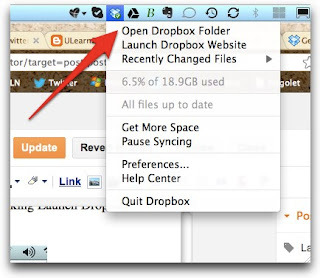 Once your content- a movie, pdf, audio or whatever is in your Public Folder go to the website by clicking on the wee box in your task bar and clicking Launch Dropbox website. Now click on the public folder to open it. 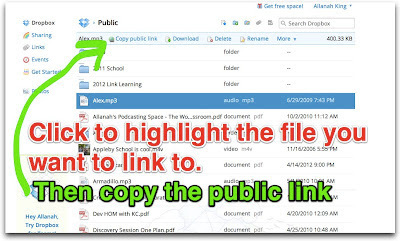 Find the file that you want to make publicly downloadable on your blog. Click on it to highlight it and copy the public link. A little box will come up with a web URL so you can share your files on your blog. 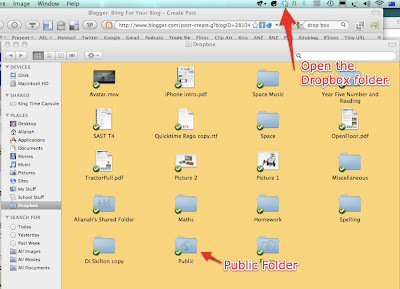 Paste this into your blog and make it into a link by highlighting it clicking up to the link button, paste the link into the pop up box and you are there. Click publish and all people have to do now is to click on your link and they can listen to or download your media. Or this when you have made it into a hyperlink. Here's the blog post to show you how to make text into a hyperlink.